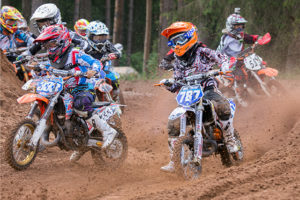 The Motocross Estonian Youth Cup series is named in 2015 after the main sponsor Hartwall Jaffa and there will be ten competitions held altogether this season. Compared to the previous year there are more youth classes that compete in the Hartwall Jaffa Motocross Estonian Youth Cup in 2015. The classes are 50cc junior, 50xx, 65cc, 85cc, Quad 50 junior, Quad 50, Quad 100, Quad 200, Mini MX Open and Mini MX Hobby. All the races count towards the overall result of the series. 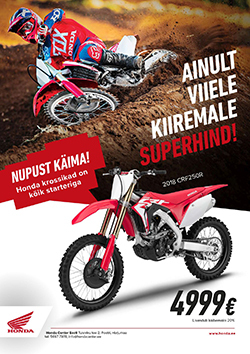 The overall winners of all classes will be able to participate in the 2016 Estonian Motocross Championship series for free. The overall winners will be awarded at the Estonian Motorcycling Federation Grand Gala in autumn 2015. In the classes 50cc junior and Quad 50 junior all the participants will be awarded, in the remaining classes the TOP 3 podium winners. Participation Fee: 50cc junior and Quad 50 junior classes, 15 €, all the other classes 25 €. A national or international licence issued by a FIM member federation is required. One-time licences are also available on the spot for 10 Euros (accident insurance is included). Bikes and equipment for rent: If you do not have your own bike, but would still like to compete, there is a possibility to rent a motorcycle from AS Ramo who is present at every competition. Equipment is also available for rent. The rent of motorcycles+equipment costs 20 Euros. The motorcycles are 50cc Mini type (wheels 10 inches front and back).